I can't believe it! Its the beginning of a new year. 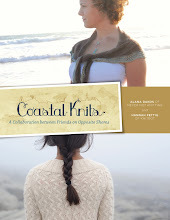 What would a "January 1st blog post" be without the previous year's knitting recap...? First there are the gifts. These are the things I made for friends and family members. It is always nice to give a handmade gift. All of these things were welcomed and appreciated by the recipient. 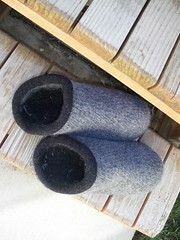 My father in law wears the slippers I made him constantly. My husband has washed and worn his "Rustic Cables" cap several several times over the year.. (well I did the washing..) It has held up fantastically by the way. 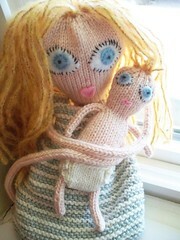 And the Knitted Babe that I made for my niece is very much loved and she is quite content at her new home. As for the Dad Sweater... it's still waiting for its zipper which had to be special ordered. Yes, my Dad still hasn't received his sweater, hopefully soon. 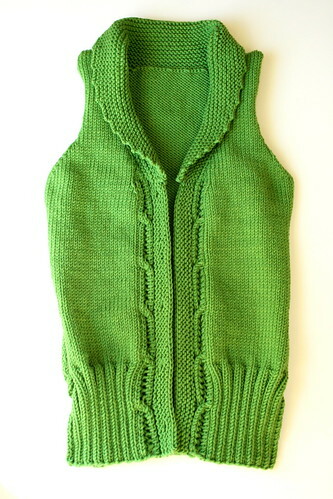 But the sweater is finished and if he doesn't like it.. well.. there will be problems. Speaking of sweaters... I've completed 7 sweaters/knitted tops for myself this year! My favorites are the Lush and Lacy, Tilted Duster, and Cap Sleeved Eyelet Top. I've worn my Tilted Duster dozens of times now. 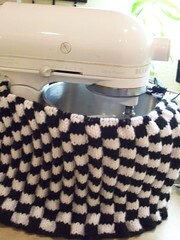 I'm so glad that I made a sweater that has gotten so much use. I have only worn my Terese Sweater twice. Unfortunately its not a sweater that goes with many outfits.. : ( But it still is pretty. I have strangely only knit 2 scarves for myself this year... Guess I'm not a scarf knitter..? But I have worn them a lot and wish that I had made more! I have however knit many pairs of socks.. and all of them are miiiine! I wear hand knit socks nearly every day. 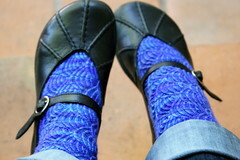 The worsted weight Basic Socks get the most use, and the Evening Stockings are worn the least. They are just too pretty to wear under pants and they unfortunately get a little saggy with wearing which is annoying. 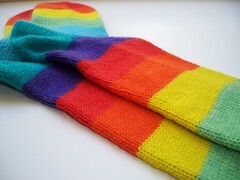 The Rainbow Socks have held up the best, and the Pomatomus although my favorite are currently out of commission. 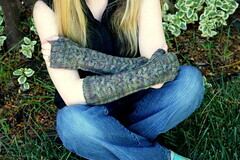 Only one pair of fingerless mitts this year.. don't know why. I like them a lot, they keep my hands surprisingly warm! 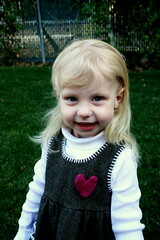 I like all of the projects I have mentioned so far, but I LOVE the projects I have knit for my daughter this year. 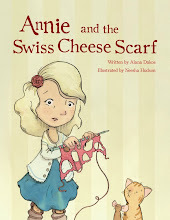 There is something about knitting for little ones. It's just fun and gratifying to make tiny things. 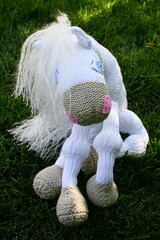 And its so sweet to see the excitement of giving a small child a new knitted surprise. I love the toys the most. They were the most fun to knit. The hats have turned out to be very practical since she wears them all of the time, and that seed stitch coat is still gorgeous, but sadly too small... All of that work... such little payoff. 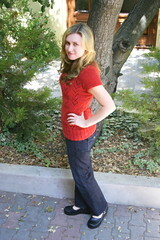 The Legwarmies that I designed ended up being a huge hit on Ravelry! There are so many projects! Well that wraps up 2008. This year I plan on changing things up a bit. I have big plans for myself and my knitting. You'll have to keep reading to find out. 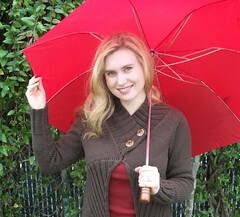 I have some knitting classes coming up! I am excited to teach my first classes at "Yarns at the Adobe" a quaint little yarn shop a couple of towns over. 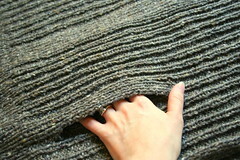 On January 7th I will be offering my Gauge Swatch Workshop from 10am-11am. 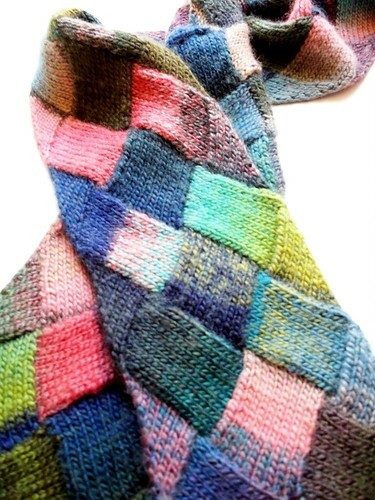 Also I will be teaching an Entrelac class on January 7th from 11:30-1:30. I taught this before many many times last year. It was such a fun class for me to teach. 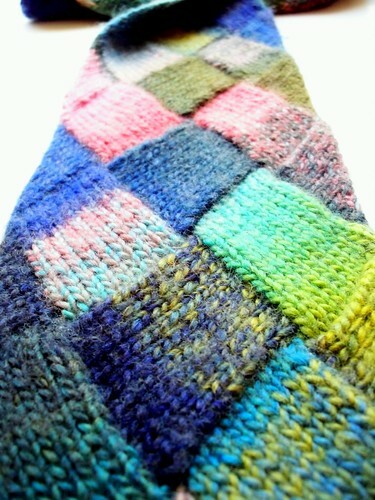 Entrelac is challenging with alot of things to keep track of but is fun and interesting to work up. And the results? Gorgeous! 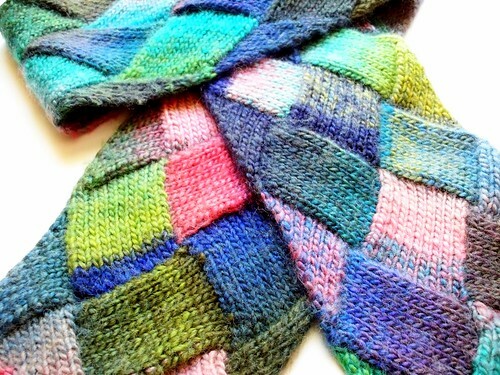 The entrelac scarf we will be starting in class is the "Danica" pattern from knitty.com. I used 3 skeins of Trendsetters Tonalita (which is a self striping yarn) for the pattern instead of the 2 different colored yarns that the pattern calls for. I love the way the Tonalita colors block out into each entrelac rectangle, and its so nice to not have to switch colors every 5 minutes. Approximately 300 yards of any self striping worsted weight yarn will do. Email me at nevernotknitting@gmail.com if you are interested in signing up for these classes or if you have any questions. Yes. These are my lovely most favorite socks that I have ever knit, Pomatomus. And yes, there is now a big hole in them. It is so so sad. I cant believe this has happened! I have never gotten a hole in any of my socks before. I treat my hand knit socks soo carefully. AND...I hardly ever wear them around the house! I always take them off as soon as my shoes come off. They are meant purely to be worn with my special shoes and then back to the drawer they go. So how does a hole of this magnitude happened with the level of care and attention my socks receive? You'll never guess but it was the shoes. My favorite pair of Mary Janes have a buckle that has come loose over time and now there is a little poky part where the buckle attaches to the strap. One day after work as I was slipping my shoes off the buckle snagged on a strand of yarn and well... the rest is history. I am just really disappointed that this happened to my favorite pair. 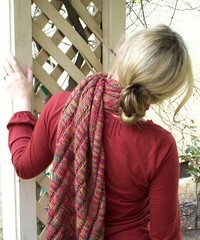 Especially in the lovely patterned part on the top! 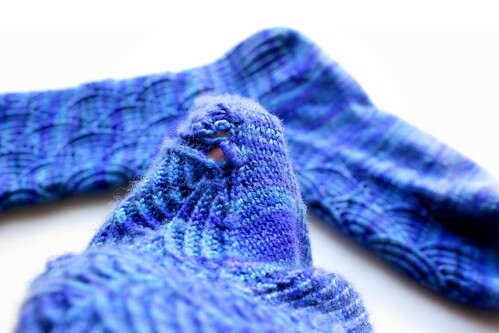 It seems that it would be so much easier to fix and hide if the hole was in the stockinette portion. Why did this have to happen to the pair of socks that took me a month to knit.. and that I painstakingly swatched for in 3 different yarns? Why couldn't my ugly, saggy first pair of socks been snagged? WHY?!? I am not sure how to fix it. Does anyone have any good ideas for me? Because one cannot own too many green sweaters, right? I don't know why I am attracted to this color so much. I can't get enough. 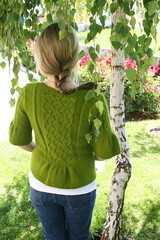 I already own 3 green hand knit sweaters and even have other green yarns stashed to make more. And yea, it's all in this shade too.. pea green. The uglier the better. I purchased this Zara Plus yarn at a 75% off sale at my LYS. Its funny because as soon as I saw the range of colors going on sale, I made sure that everyone knew.. the green is MINE. The funny thing is that nobody wanted this color anyways. But it was love at first sight for me. So I am finally getting around to using it and I decided that it will become the Sienna Cardigan from Interweave Knits Fall 2006. So far I'm enjoying it and its knitting up really quickly. You gotta love projects on size 9 needles! I know that these posts have been heavy on the cute kid pictures, but what can I say? 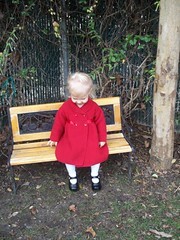 So my daughter received this awesome little coat as a hand-me-down from a friend. Its so chic.. so grown up.. I thought a little beret would be the perfect compliment to the ensemble. 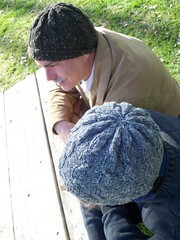 I knit this hat up in Karabella Aurora 8 yarn. It is quite springy and nice to work with. It blocks out surprisingly big which was a good thing in this case because the hat ended up being a little too small even after I increased the stitch count. 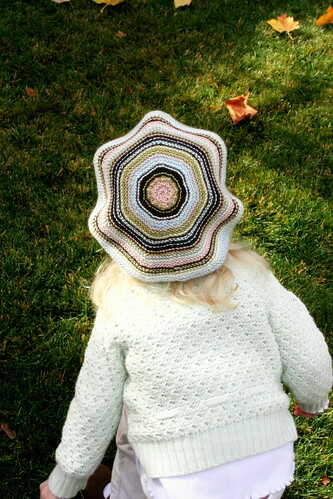 The hat pattern I used is called Pompon Beret out of the book Simply Baby by Debbie Bliss. And yes.. about that pattern name. Huh?? Am I a complete idiot or should it be called Pompom Beret? 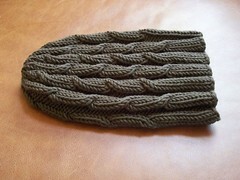 That being since the original pattern calls for a large pompom on the top of the hat. Or is it a pompon? Have I been calling pompons "pompoms" this whole time? Should I be embarrassed here? Well I didn't care for it. The pompon/m that is. I wanted something a little bit more dressy. So I crocheted a flower out of Rowan Kid Silk Haze remnants leftover from a horse. I really like the ethereal look of the mohair. It adds a little extra style to the plain beret. 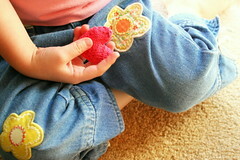 Once the flower was crocheted, I finished it off with a rhinestone vintage button sewn right in the middle. I've been using this crocheted flower pattern for centuries. It's my own adaptation of another flower pattern I found in a crochet book years.. I mean centuries.. ago. So.. now you can make it too. Ch 4. Connect with slip st to first ch to form a ring. Ch 1 (sc in ring, ch 6) 5 times. Join with slip st to first sc. Ch 1 (1sc, 10 tr, 1sc) in each ch-6 space around. Join with slip st to first sc. Ch 1, working in front of petals, sc around first sc on round 1, ch 4. (sc around next sc on round 1, ch 4) around. Join with slip st to first sc. (1sc, 6 dc, 1sc) in each ch-4 space around. Join with slip st to first sc. Ch 1 (sc around sc in front of petals ch 2) around. Join with slip st to first sc. (1sc, 3 dc, 1sc) in each ch-2 space around. 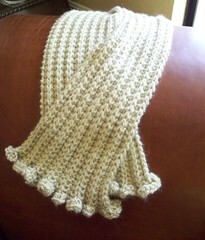 You can use any weight of yarn and any size hook. It will just produce different sizes and effects. For the mohair flower I used a D crochet hook to make the flower small. You can dress up the flower with a sparkly bead or button such as I have done here, or keep it casual with a nice plain button or knitted bobble. 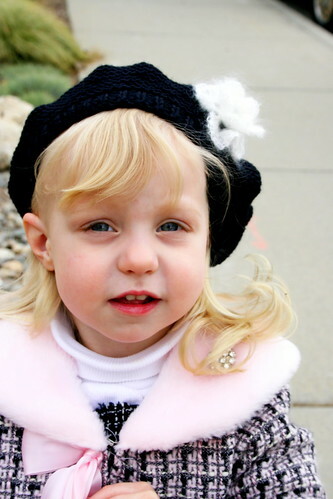 "Mommy knitted me a hat with a beautiful flower and diamond." Well.. I've had a rough week. A lot of things have happened and not happened in my life recently which has been a little stressful. I've decided to make a change in my job and just teach classes for awhile, so I am currently not working at the yarn shop. I am going to miss seeing everyone so much but I think that this will be a good move for me. I plan on devoting a lot more time to design work and that makes me feel excited. So I'm gonna go with that for now. So if any of you reading live locally and don't see me around the shop, don't worry. I'm still here.. and still knitting. 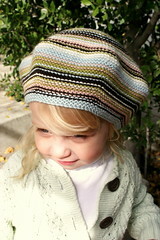 I finished a cute stripey beret for my little one out of the book Debbie Bliss Baby Cashmerino 3. I used up scraps, got to knit something using more than one color, and knit it from start to finish in only a couple of days. After the Sweater Beast, I needed this project in my life. I unfortunately look ridiculous sporting a hat. I usually hate all hat styles on myself. I think sometimes that I want to be a "hat person" but feel so stupid wearing one that I can't seem to keep it on top of my head. 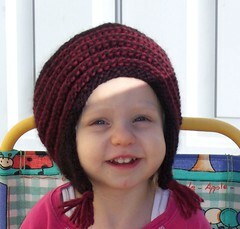 So I am compensating for my unfufilled hat desires by knitting them for my daughter. 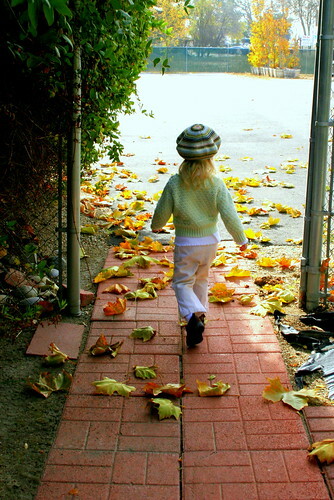 What is it about little kids? They can wear anything, and it looks so cute! I mostly really enjoyed making this project. It was fun and kept my interest changing colors so frequently. However the color changing made this project quite unportable and it was often tangly and annoying having all of those different balls of yarn attached. When I started this I thought for sure that I was going to make at least 2 since I have so much of this yarn to use up. But then I wondered if I should bother spending all of that time making the same thing over again. After finishing the first beret, I was over that idea. I decided to still make her another hat instead. 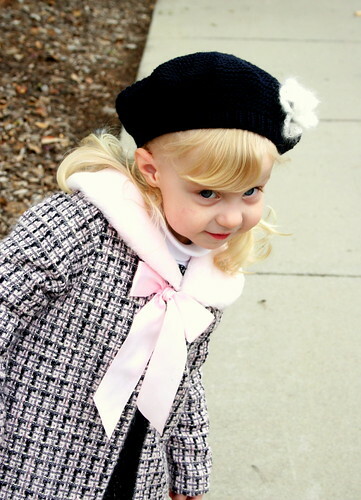 But this one is a "dress" beret. Its all finished and ready for me to photograph. 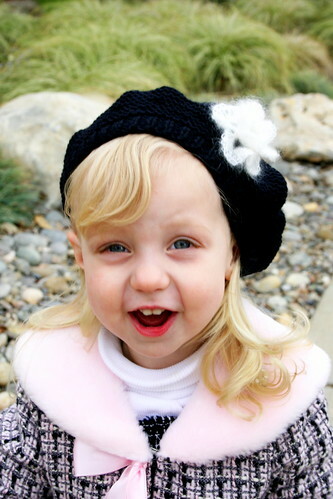 So there will be more toddler-wearing-hat shots coming your way! I just started this fun little beret for my daughter. Its so colorful and cheery I don't want to put it down! 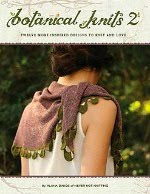 This all started a few months ago when I compulsively purchased the book Baby Cashmerino 3 by Debbie Bliss. I stupidly bought the book just for this pattern. 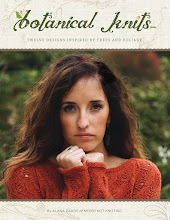 All of the sweater patterns in the book go up to only size 18 months or so. (Too small for my daughter.) Sooo basically this book had absolutely no use for me except for this "must-knit" hat..
That's what I thought anyways.. until I sat down and actually started it. I pulled out my generous stash of Baby Cashmerino yarn, mixed and matched colors, pulled out my book, started reviewing the pattern, and then... then.... I realized something. Not only had a purchased a book for only one usable pattern, but the largest size given for this said "usable pattern" was only 6-9 months. Well. Yea. 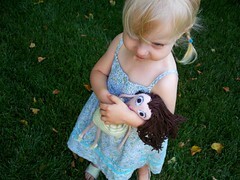 My daughter is almost three. Yea.. she's only in about the 25th percentile for height and 10th percentile for weight, but her head size for some reason is in the 95th percentile range. So you can see why I was a little disappointed about the beret. I knew that a traditional 6-9 month size was never going to fit my darling daughter's ginormous head. But then there was the fact that hadn't been considered yet. It was a Debbie Bliss pattern, and my experience with her patterns has proven that they are often over sized, extremely over sized... Click here if you don't believe me. So dont worry, this story has a happy ending. 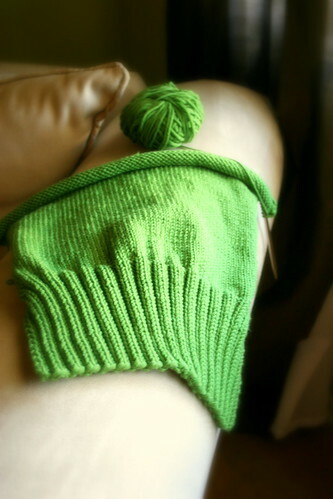 I went up only one needle size and the hat looks as though it is going to fit perfectly.